On my little "Ry Guy"! He is Still as healthy as can be... and noticing things around him. I love it when I hold him, because he just stares right at me. It is the most precious thing in the world! He has a little swimg that plays music and has a dancing fish mobile and he looks at the fish now. (That is what he is doing in this picture) It is so amazing to see him grow - everyday he looks different! I love being and AUNTIE! I haven't posted all week - it has been quite a good one though! TL and I went CUPCAKE tasting for our wedding with my dad. Our wedding planner is absolutely fabulous, and the planning is coming along. It is so much fun and in just a few weeks we are starting to really get in to the smaller details! AND!! My dress is in! I am going in for my first fitting next week. I am so excited! 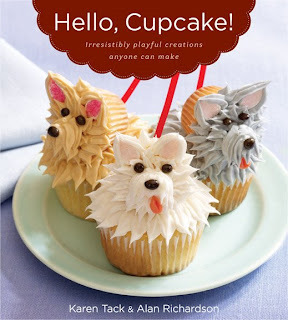 Also, while TL and I were shopping for new throw pillows for the couch at Bed Bath & Beyond, I found this Cupcake Book that I really want! Its called "Hello, Cupcake!" and it gives so many cool ideas! I have that book and it's fabulous! yay on your dress being in!!!!!! i'm so excited for you!!! I LOVE your blue wedding shoes - I dream of a pair of Manolos....who doesn't!!! I just love it when you read someone's blog and think "Yes, me too"!! PS I don't suppose there are any cowboys in that Cupcake book are there? I am looking for a good cowboy cupcake design.